OAuth is a simple, versatile and widely adopted standard that can enable a covered entity to verify that an app requesting access to PHI is indeed controlled by a trusted patient (documented in a prior blog post Patient Consent Forms: Redundant in the World of OAuth2?). Once a covered entity can securely link an app to a trusted/verified patient of theirs, the entity can then trust the app in order to send the patient’s PHI. Also, as a part of OAuth, a patient can restrict how much of their PHI to share with the app. They may choose to share all PHI, only a specific set, or not share anything at all (remember the U2 album that automatically showed up in everyone’s iTunes account whether they wanted it or not?). Make use of FHIR resources like consent or contract so that patient preferences can be shared more easily (for example, with the contract resource, a covered entity can represent patient authorization as a legal document signed by the patient). Imagine you have a new iPhone app that can pull your PHI from any hospital of your choice. You fire up the app, search for your hospital X, and upon finding it, you click on a link that says “download my health records from hospital X”. Hospital X wants to verify that it is indeed you making this request, so it asks you to log into its online patient portal (using OAuth). By logging into the portal, you make a secure link between your patient account at Hospital X and your iPhone app — a link that Hospital X can now trust. Next, Hospital X requests you to specify how much of your PHI you want to share with this iPhone app. How about providing the following three choices to the patient? This is the default -- security folks are conservative, so we always assume the worst -- that you as a patient may have been just playing around with the app, and didn’t really want to download all your PHI on your cousin’s new iPhone X which he was showing off at the Thanksgiving dinner). “Restricted” is a FHIR security label indicates “highly sensitive, potentially stigmatizing information, which presents a high risk to the information subject if disclosed without authorization.” Examples: sensitive conditions, mental health, HIV, substance abuse, domestic violence, child abuse, genetic disease and reproductive health. The good news is that FHIR as a community has formal processes to take discussions like these and turn them into implementation guides (IG) — clear technical specifications which illustrate how to use FHIR’s open standards and enable practitioners to make the standards work for specific use cases and workflows in healthcare. 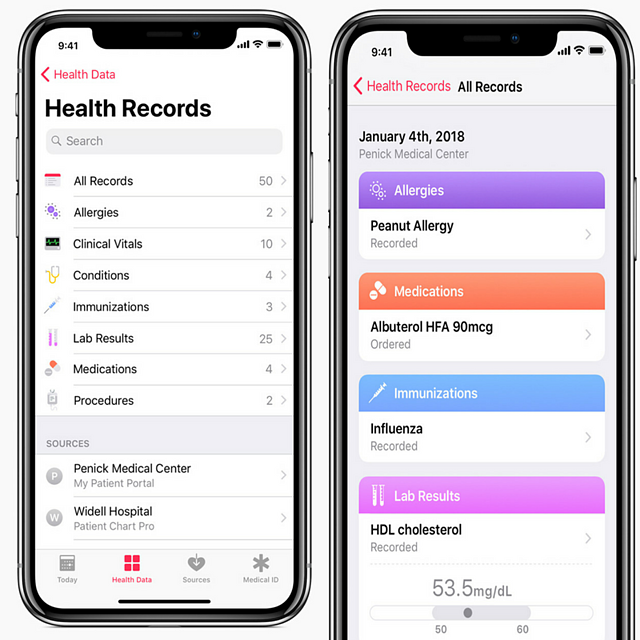 In promising patients an “effortless solution bringing health records to iPhone”, and adopting HL7 FHIR, Apple has embarked on a worthy cause where they can help immensely by promoting widespread adoption of open standards and best practices to achieve interoperability. I hope Apple, and other app developers, can leverage the IG’s coming out of FHIR Connectathon tracks like CCDE, and also make their own contributions to improve the process. Sandeep is a Technical Product Manager at UCSF (University of California at San Francisco) Center for Digital Health Innovation (CDHI). He is working on an interoperability project based on a federated model of FHIR services. Sandeep has held several CTO, Product Manager, and Software Architect roles since the late ‘90s. You can reach Sandeep at sandeep-dot-giri-at-ucsf-dot-edu or @sandeep_giri on Twitter.